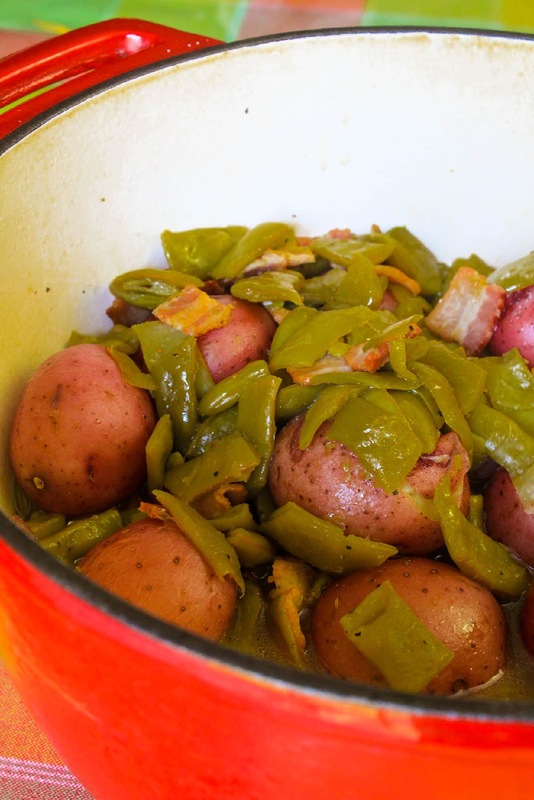 Fresh Green Beans and New Potatoes, simple side dish full of flavors from the garden, homegrown green beans and the first crop of new potatoes. Fresh vegetables are the best unless they are fresh out of the garden, and then you cannot beat them. 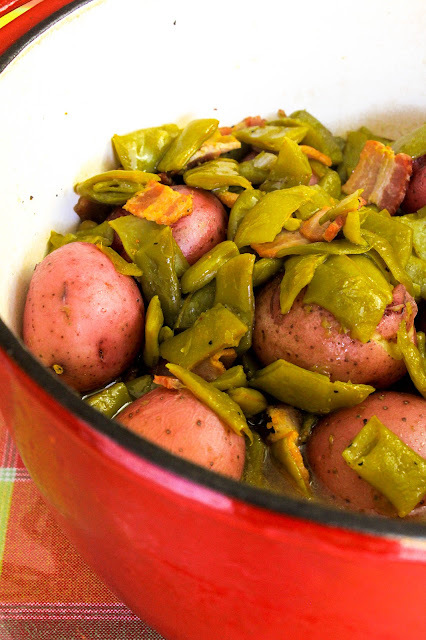 I love Fresh Green Beans, and New Potatoes cooked together with a little bit of ham or bacon. Growing up, we could not wait for the first crop of green beans and potatoes to come out of the garden. This is another one of those side dishes that Mother would cook a pan of cornbread, slice some onions and tomatoes, and call it a meal. Oh! Another thing, pepper sauce was always on the table alongside the salt and pepper to go with all that lovely pot liquor. Green Beans were on our Easter table this year. They cooked up relatively quick and really went well with the rest of our Easter menu. 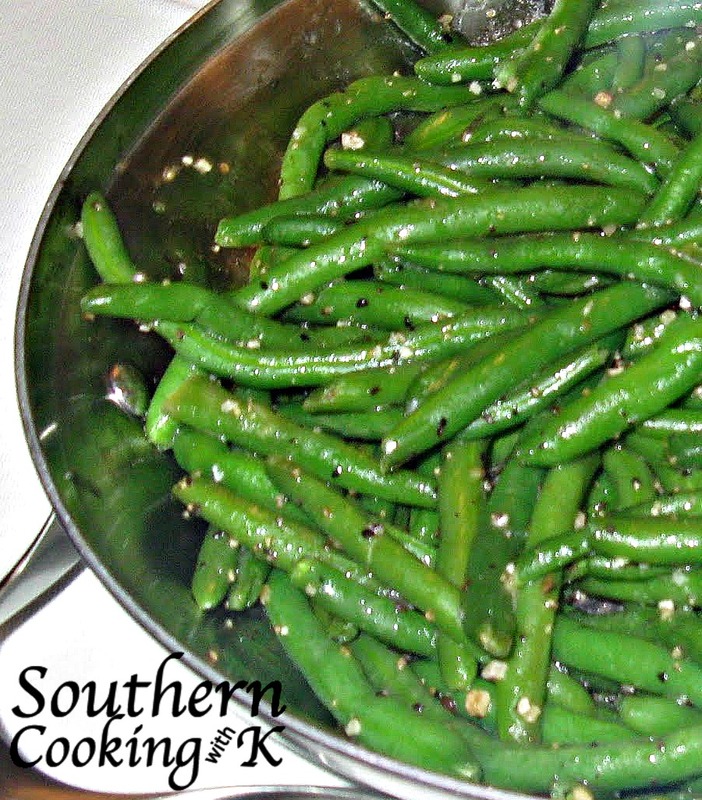 When I cook Fresh Green Beans and New Potatoes, I leave the green beans and the potatoes whole. 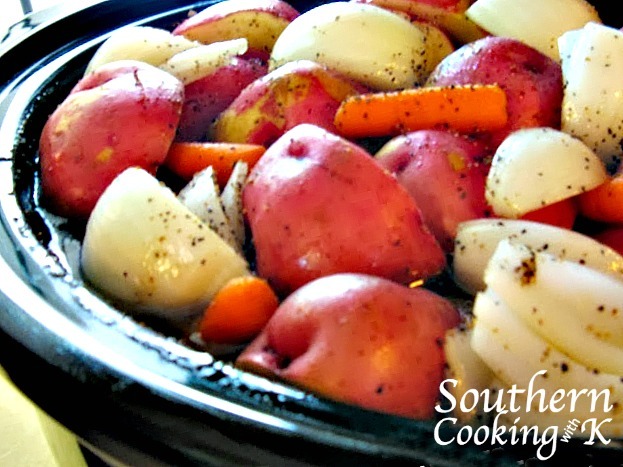 It is best to try and have all the potatoes close to the same size, so not to over cook some of them----and when you reheat them, they are not mushy. We love them leftover, so I usually cook a lot at one time. 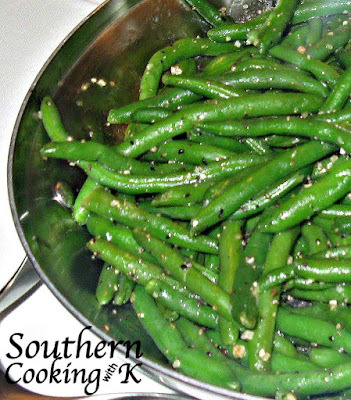 In a large Dutch Oven, cook green beans and ham on medium heat with water up just over the beans. 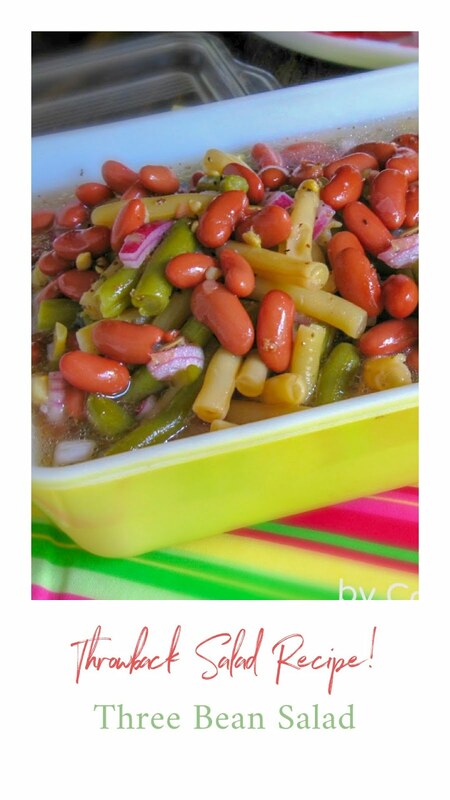 Cook for 30-45 minutes. The amount of ham, salt, and pepper can be adjusted to your taste. 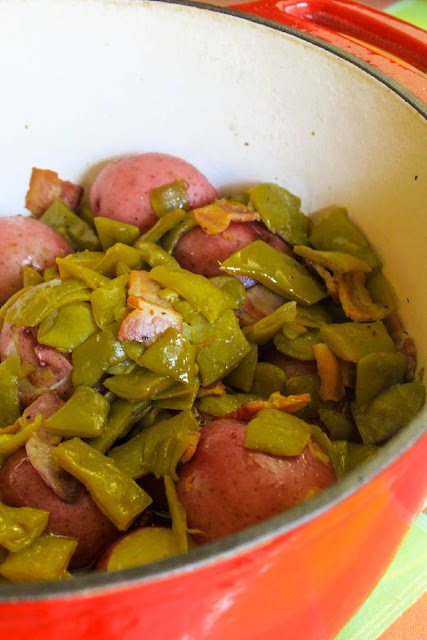 A simple side dish full of flavors from the garden, homegrown green beans and the first crop of new potatoes. Amount of ham, salt, and pepper can be adjusted to your taste. 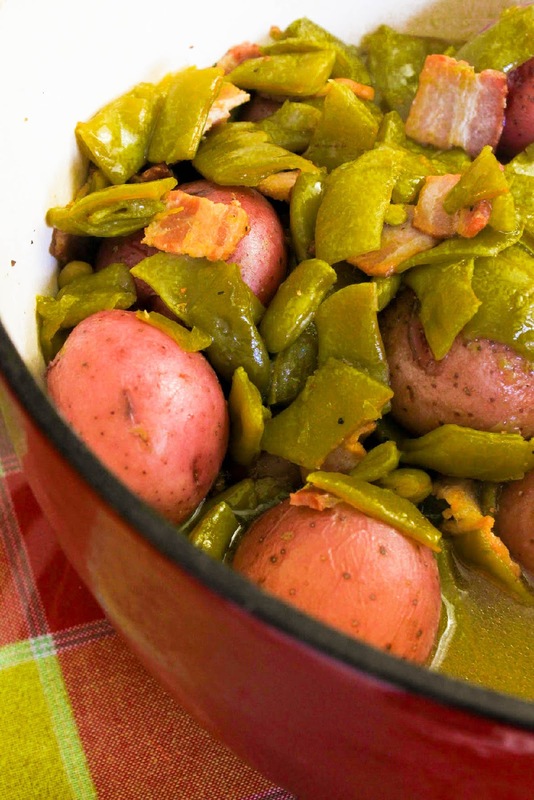 Yum, Love the combination of potatoes and green beans! Nothing beats fresh from the garden! 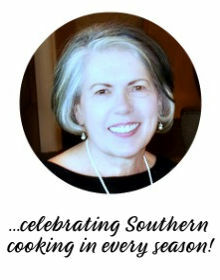 Kathy ~ thank you for stopping by CWK...have a wonderful week! Delicious - no need for anything else in my world! WOW! I love me some red taters...hook them up with fresh green beans and some ham, and I can eat it all myself. 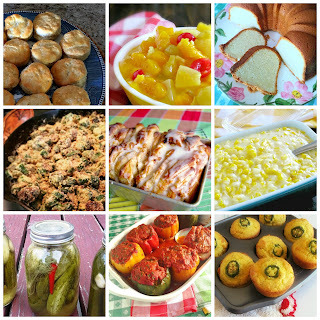 Thanks for your awesome homestyle recipes. Keep em coming K! I just love Green Beans and New Potatoes, as a matter of fact I made a pot of them just the other day. Your Beans and Potatoes look awesome, I would just like a bowl of them right now. Hope you are having a great spring week end and thank you so much for sharing with Full Plate Thursday. 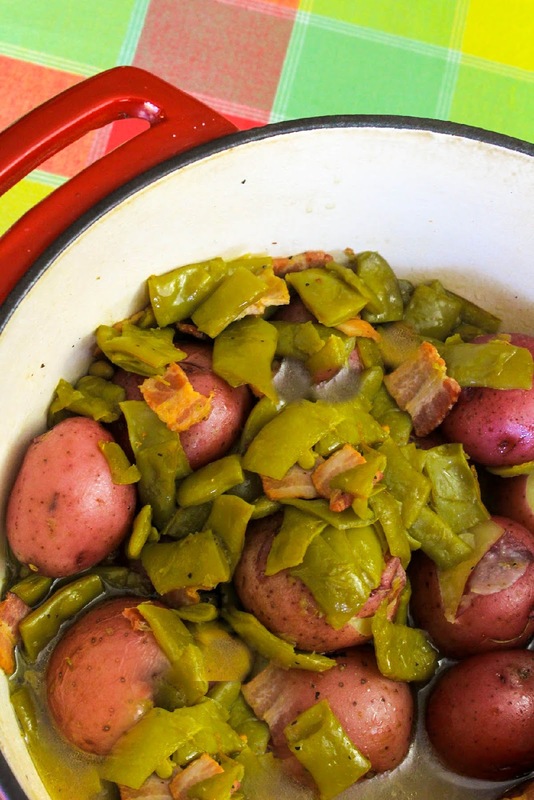 Green beans and new potatoes are my favorite summer meal! The only thing I add to my recipe is a sprinkle of dried onion while the pot is bubbling. Adds just a little more flavor.